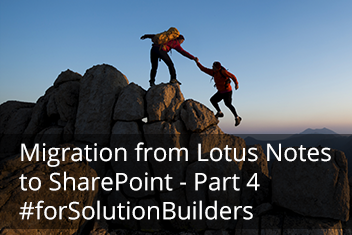 Migration from Lotus Notes to SharePoint - easy with skybow - Part 4. In the first three chapters I introduced you into the development of a "Request for leave" solution and began to show you how it can be easily migrated from Lotus Notes. Here we talked about "Data Modelling", the "User Interface" and "Data Processing". Today I want to discuss with you the last step - "Reporting" - and bring our whole journey to a conclusion. Once the data has been entered, the next step is processing. With skybow Solution Accelerators, this is done through actions, stages, and expressions. Reporting is the last bit in the solution usage cycle. SharePoint itself does not offer any reporting capabilities. SQL Server Reporting services can be used for complex reporting, and BI dashboards can be used for visualizations, but simple reporting based on SharePoint data is not possible out of the box. One of the things skybow offers is automated document generation, as an action (regardless of manual, conditional, or scheduled), with the possibility of parsing and evaluating skybow expressions. This enables full-fledged reporting based on SharePoint data. For the “Request for leave” use case, we can create a report with all company-wide, or department-wide, approved requests as a Word or PDF document, and send it each Friday evening to the CEO as a scheduled action. It sounds simple , and it is – this is the power that skybow Solution Accelerators offer in the reporting space. Since Word is a tool that everyone can use, creating and modifying reports is extremely easy. Through the expressions, which can be built directly in Word template fields, a lot of automated calculations can be done in those reports. skybow Solution Accelerators are an end-to-end solution development platform on SharePoint. The “Request for leave” use case that we took as an example here, with two-step management approval, a decent UI, and management reporting, would take two to three men/weeks for a skilled SharePoint developer, plus the whole testing/deployment cycle. With skybow Solution Accelerators, we are talking about hours. And this is the major benefit of skybow Solution Accelerators: development, deployment, and change response times are decreased by 85% percent in most cases. When we speak about the ALM cycle, this refers to those areas where benefits are greatest and cost savings are enormous. With SharePoint Server, you can replace the core functionalities of Lotus Notes. With skybow Solution Accelerators, the missing piece – Lotus Notes-based solutions – can also be painlessly transitioned to SharePoint.